Norway’s reigning chess champion was settling into another day of competion at the World Chess Championships in London on Monday, after having to all but bulldoze his way through thick criticism and questions. No one can understand why he hasn’t won a single game so far, after seven chances. “It has looked like he had a bad day on the job,” his father Henrik Carlsen told Norwegian Broadcasting (NRK) heading into the weekend, after his son had “fought infernally” to save himself against a loss to his challenger Fabiano Caruana. He managed, but by the end of the weekend, the score was still even between them. 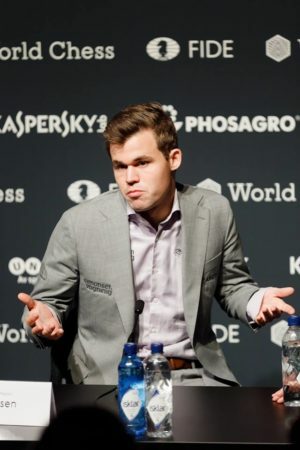 Some say Carlsen “has lost his killer instinct.” Others claim he’s close to “crisis.” Still others, including his manager Espen Agdestein, blame more simple miscalculations while Carlsen himself has admitted to some mistakes. His ability to save himself with another remis (tie) on Friday was proclaimed as “incredible” and, well, masterful. “That was the biggest drama we’ve had so far in this championship,” said NRK’s commentator Torstein Bae. He sparked laughter at a recent press conference when asked which chess players he’s liked in the history of the game. Carlsen said he doesn’t have any idols as a rule, but he thinks his favorite player “is myself around three to four years ago.” That remark even brought some applause, while Carlsen shrugged and grinned. Commentators, Carlsen himself and those closest to him are likely doing all they can to solve that mystery. His rating has dropped from 2872 when he first became World Champion in November 2013 against Vishy Anand, to 2835 now. There were 69 points between him and his next-closest rival at the time. On Sunday there were only three. Play continued Monday afternoon in London. The first of the two to reach a score of 6 wins.